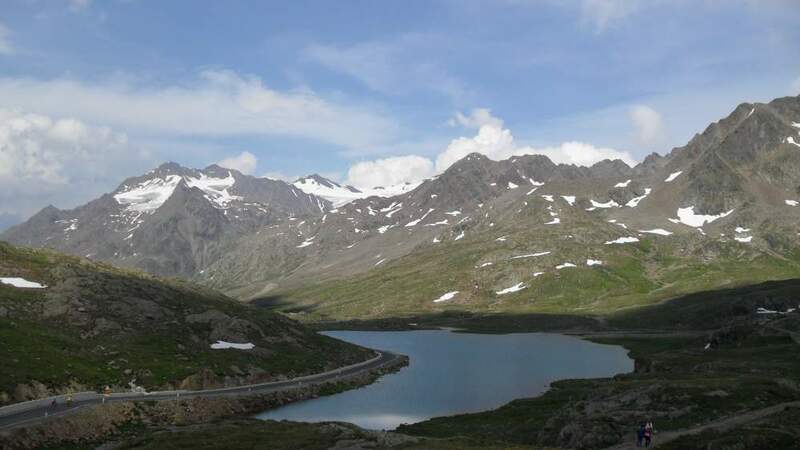 Gavia pass (Passo di Gavia, 2652 m) is one of greatest road passes in the Alps. According to Wikipedia this is the 10th highest paved Alpine road. One of those roads, Stelvio pass, I have described in an another post within this site. 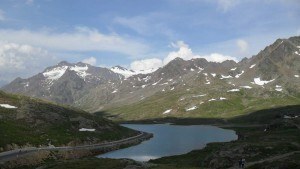 The Gavia pass connects regions of Bormio and Ponte di Legno, in the Italian Alps. 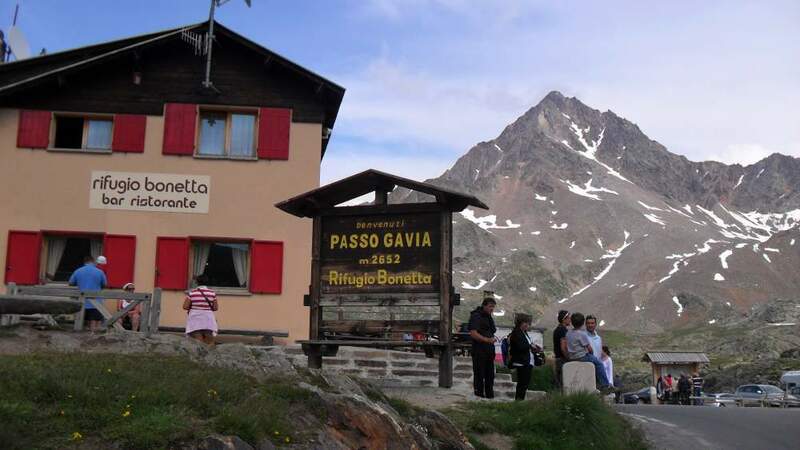 In the past, the pass has been many times the part of Giro d’Italia bicycle race, so you can imagine how hard it can be; the height difference between the pass and Ponte di Legno in the south is around 1400 m.
The altitude sign at the pass, in front of Rifugio Bonetta. Click to enlarge the photo. You will notice that in Wikipedia the altitude of the pass is given as 2621 m. But the sign at the pass, which you may see here on the right, shows the number 2652 m, and this is what I used above. 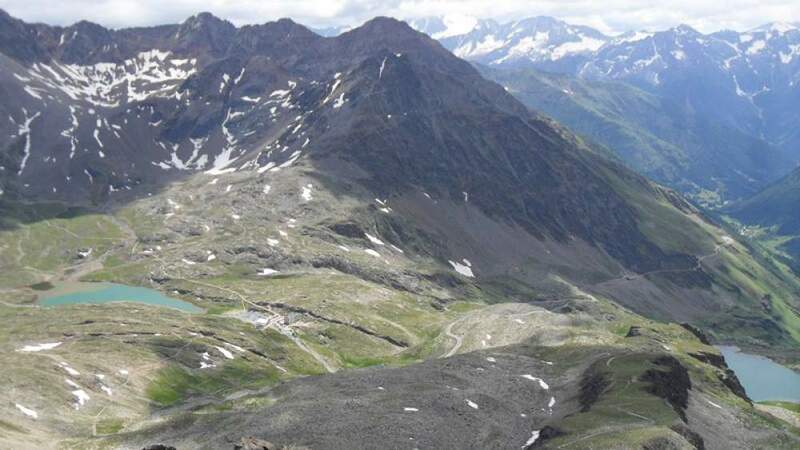 I have been at Gavia pass several times, and here I give some information about the area and about possible climbs. The photos you see here are from different visits, hence so different weather conditions although it was always summer time. There are several nice mountains to climb around. 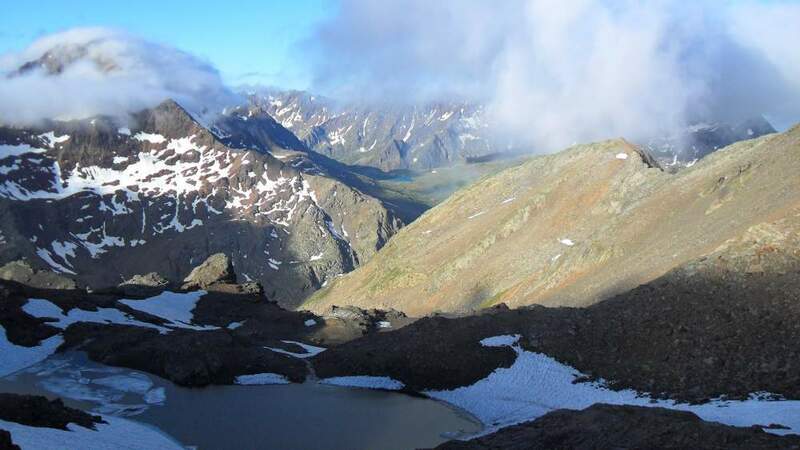 Monte Gavia (3223 m) is at the northwest side above the pass, Monte Gaviola (3025 m) just in the opposite direction. I have climbed them both. Corno dei Tre Signori (3360 m) in the east, all three at nearly the same distance from the pass. 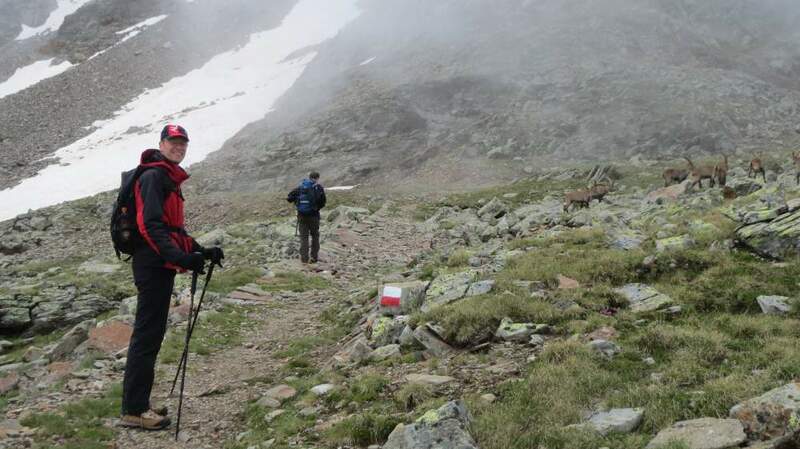 A bit farther is Punta della Sforzellina in the north-east direction, and the start point for this peak is Rifugio Berni, a couple of kilometers below the pass, in the direction of Bormio. 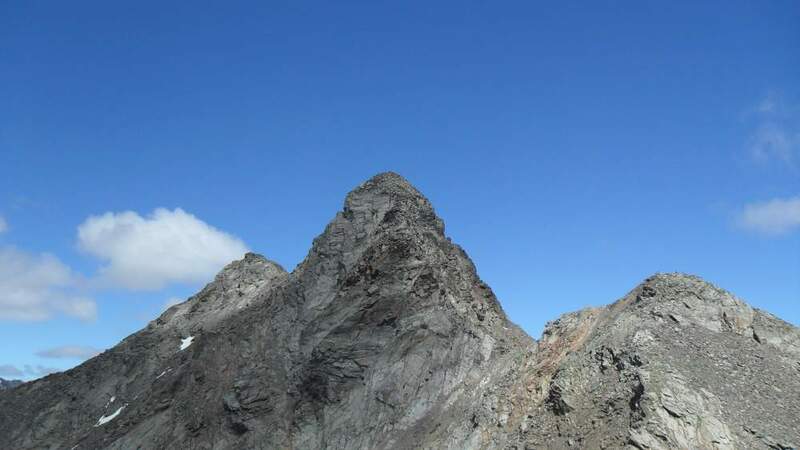 The easiest to climb is Monte Gaviola, and you can reach the summit within 90 minutes. 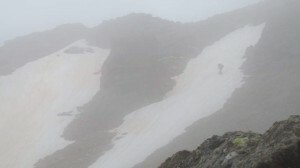 When I climbed it, on July 29, there were some sections with snow. This made the climb a bit tricky, otherwise, this is a truly easy summit. The first part of the route is along the road built during the first world war. Many trenches are still around from that time. There is a simple wooden cross on the summit. More difficult is Monte Gavia on the other side of the pass. The final 100-150 meters are a rather hard and steep scramble. You can reach the summit in less than 3 hours. You will not need any special equipment for these two mountains. Corno dei Tre Signori is also directly above the pass, at its east side, but the access route is long, you go around the mountain and approach the summit from its east side. There are fixed cables at some places. 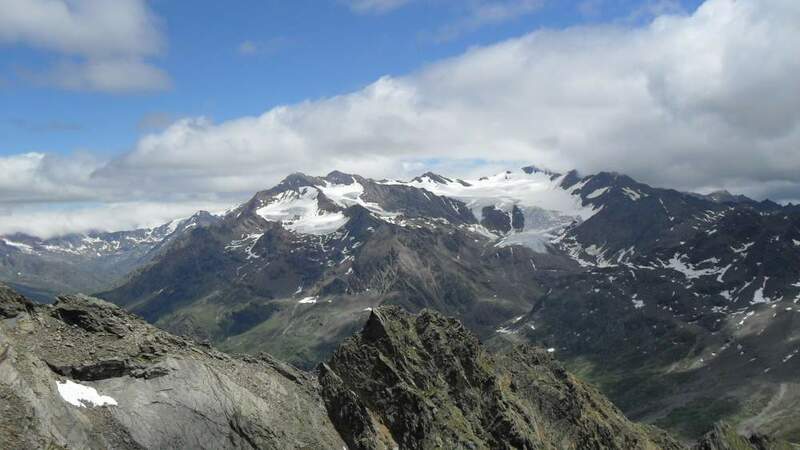 For those willing to climb a bit more, this is a paradise with many great peaks, including Tresero (3594 m), Punta Pedranzini (3599 m), Cima Dosegu (3560 m), Punta San Matteo (3678 m), Cima Valumbrina (3222 m), Monte Mantello (3517 m), etc. I would like to point out my climb to Cima Valumbrina described here in a separate page. 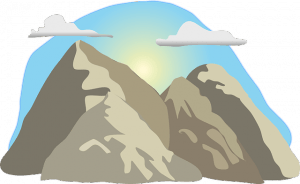 The first 4 peaks mentioned here are a part of the great 13-summits tour. This implies climbing 13 summits without getting below 3000 meters at any point. It should be stressed that these peaks and the tour nearly completely coincide with what used to be a front line one century ago. Simply unbelievable. Some of these are hard climbs which require special equipment for glacier walks and for rock scramble. 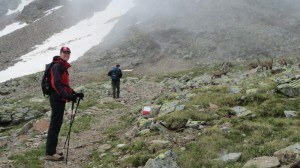 Here is a route description to the most distant and the highest of the peaks around, Punta San Matteo. The start point is the Berni hut, on the road. This is an alpinist tour which requires all necessary equipment for glaciers. The glacier on the route is full of crevasses, so going solo this route is not an option. There is a camera at the pass, so you can see the actual weather situation in any moment, so please click here to see how it is. View toward Ponte di Legno valley and the south side road. View toward Tresero from Gavia pass. Berni hut, on the Bormio road below Gavia pass, at 2541 m above the sea. 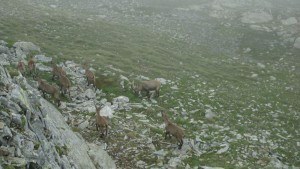 Herd of ibex at the pass. 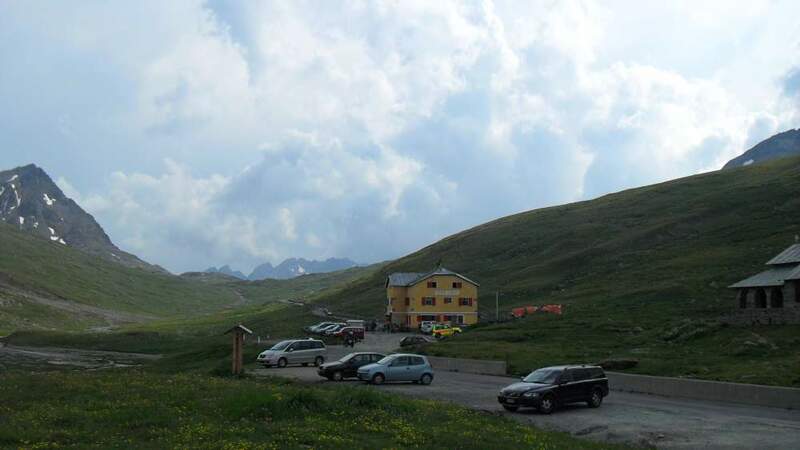 There are two huts around, Bonetta hut directly at the pass and Berni hut a bit down the road toward Bormio. The latter is the usual starting point for great tours in Tresero-San Matteo range. From the pass, you can make a whole day tour to Bivacco Battaglione Ortles and the nearby Cima Valumbrina. My story about this climb you may found in this post within the site. 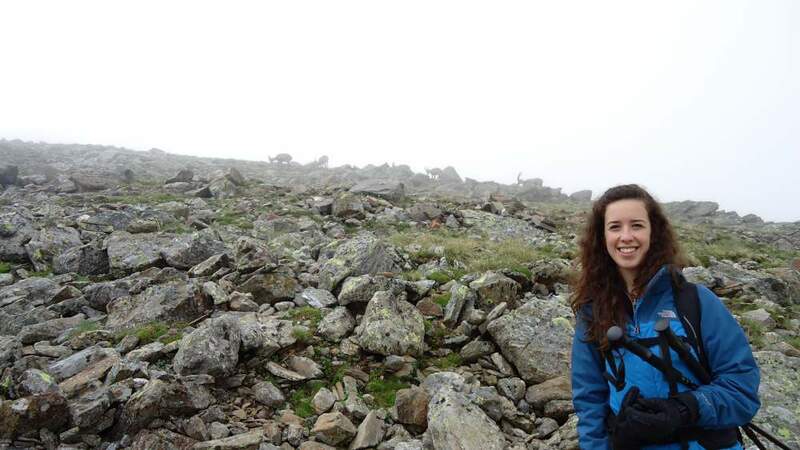 My daughter Jelena and ibex above the pass. Tibor and me, and ibex around. Not the best day, me on a snow passage. Here are a few photos from my earlier climbs to Monte Gavia, on the other side of the pass. The weather conditions were quite different. 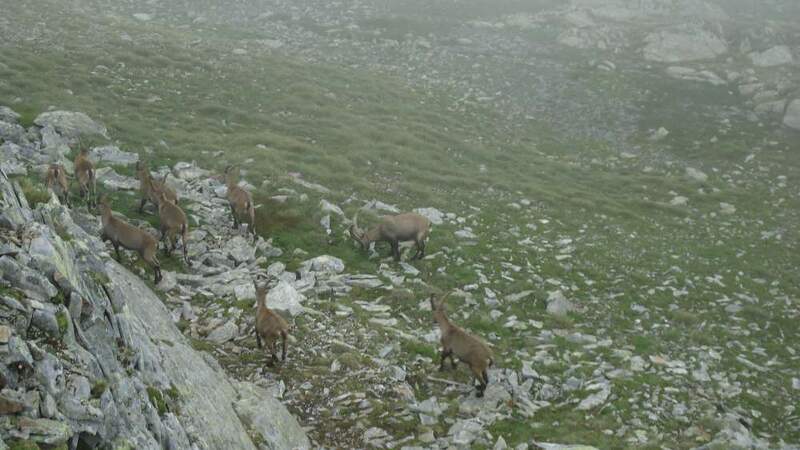 On the way to Monte Gavia, ibex gave the way but rather reluctantly, and with dignity. The steep summit route of Monte Gavia. 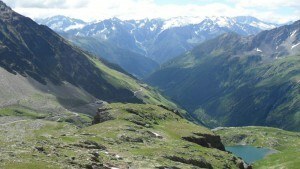 Tresero group as seen from Monte Gavia. Gavia pass in the distance, view from the route to Tresero. Both roads to Gavia pass are enormously attractive. The road from the north is good enough for any kind of vehicles, including motorhomes. Only at a few places, it is rather narrow. The road from the south is another story, I passed it once and I wonder how I did it. It was a busy day, I guess some festivity on the mountain, with a lot of traffic though luckily the majority of vehicles were moving in the same direction, to the pass. But the road is indeed narrow and far from easy, mainly in the central section above Ponte di Legno, where there are many curves. The closer to the pass the less complicated it is. I do not remember about signs at the beginning, so cannot say if it is allowed to drive with any larger vehicles, but I would not go with a motor-home from that side. Regarding accommodation in the area, I suggest you visit my another post with some useful information about agencies providing vacation homes and flats in the Alps. If you are there you might want to climb Pizzo Tresero, this is only 4 hours tour from the road. I hope you have enjoyed the page and you have realized that Gavia pass is a great area to visit in the Alps. I shall be happy to read your comments and answer any question. Thanks a lot for the information on Gavia Pass. How difficult you would say that this mountain is to climb? Is it a good option for complete beginner mountaineers to climb up? Is the scenery good and are there any waterfalls present? How dangerous the area is are there lot of mudslides and other hazards associated with mountains? Hope to hear from you soon! Hi Jesse, in fact the access to the pass is by car. 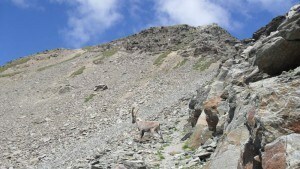 As for climbing around, there are peaks for any level of experience and with breathtaking views and water-flows around. I suggest you to have a look at this page where a group of four of us climbed to the refuge Battaglione Ortles, an object made of remnants from military stuff from the World War I. No danger of landslides as far I know. As for other hazards, these are mountains, be careful, but as I said access to the pass from the Santa Caterina Valfurva side is by a good road. FANTASTIC SITE! I will be coming back, good sir. 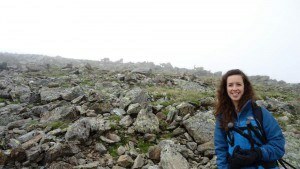 I take pride in the number of mountain ranges that I’ve visited in my 34 years – the Pyrenees, the Alps, the Caucasus (I was a Peace Corps Volunteer in Azerbaijan), the Ozarks, Catskills, the Sierra Nevada, and the Jemez Mountains in New Mexico. Mountains just have a raw, primordial majesty to them that really put life into perspective, don’t they? Great site, man! I will be coming back! Hi Zeno81, many thanks for the comment. I see that you speak from your heart and I hear you well, this resonates with my own feelings about mountains. You rightly write about their majesty. Great to reed this. Great post. 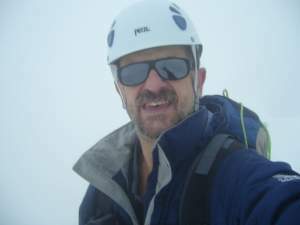 I do love climbing and walking in the alps. I will be there next weekend but not in Italy. I will travel to Switzerland near Zurich. Climbing is a great way enjoying the nature and see what mother earth was able to create. Hi Don, to start from the end of your comment: not for the family, they do not like it too much. 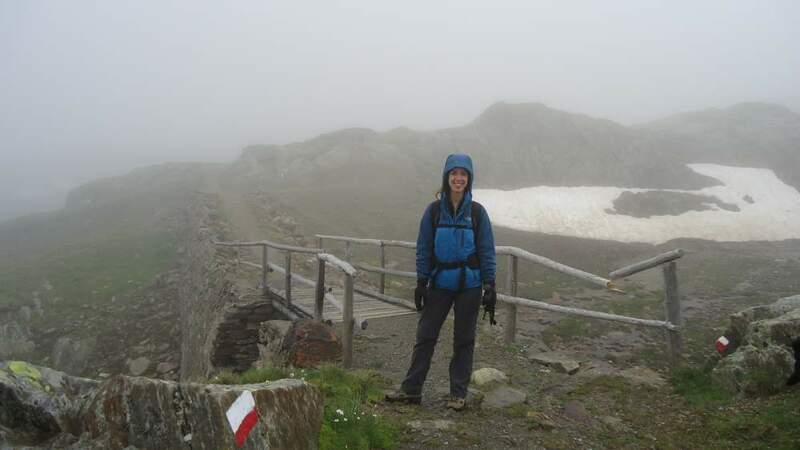 In the Alps, it is only summer time when you can do climbing, and even then you have to count on snow. I described this in one of my pages. Again, you have given us a pictorial view of how the place looks like. Hi Fidel, thanks for reading my text about Gavia pass. So you like it and this makes me happy. See a bit about Stelvio pass, it is not far from there. I actually witnessed this scene about two years ago whilst visiting a childhood friend in the alps territory. He runs a mountain bike tour business there and we spent a whole week travelling around the area on bike. It was absolutely wonderful – the scenery was breathtaking. Thank you Chris, so you know very well how it is at Gavia pass. I wonder if you have been at Stelvio pass as well, it is not far from Gavia. Hello, Jovo. Another great post. I always love reading about your awesome adventures and the photos are beautiful. I like the added music, nice touch! This area is beautiful, GaviaPass is a high mountain pass at an elevation of 2,621 m (8,599 ft) above the sea level, located in the Lombardy region, Italy. Never heard of it until read your post. Is there a safe bike route for us non-climbers?